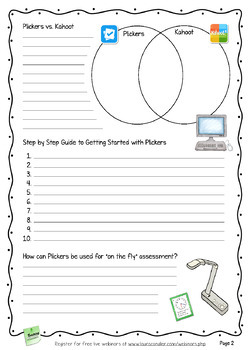 Are you using Plickers with your students? Plickers is an amazing FREE formative assessment tool that makes it easy to teach interactively. Kids love Plickers, too! The only problem is that Plickers has a bit of a learning curve, and it can be a little tricky to set up and use at first. 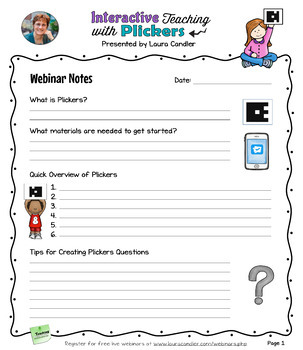 I'm so impressed with the program that I presented a live webinar called Interactive Teaching with Plickers to help teachers get started and to share strategies for using the program effectively. 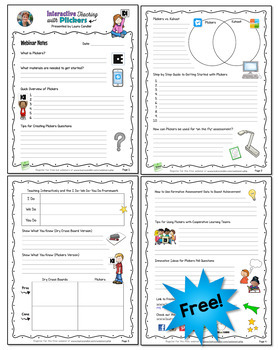 Download this packet of webinar outline pages to check out what was covered during the webinar. You can watch a free replay of the webinar, but it doesn't include a professional development certificate. Or you can purchase the professional development version of the webinar here on TpT. 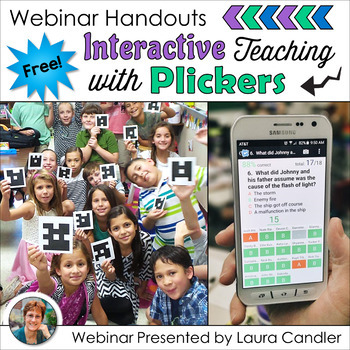 The Interactive Teaching with Plickers professional development webinar is just one of 12 products in my Plickers Webinar and Task Cards Bundle. The products in this bundle include ready-to-use task card images that you can upload to Plickers instead of typing questions. Click each link to preview the item on TpT, and if you like them all, return to this page and save over $15 when you purchase this cost-saving bundle! If more products are added, you’ll get any additional items for free!